Hey, remember before Christmas when we told you about how FreshDirect was out of many basic products and was having trouble offering prompt delivery times? And how it might have been because of an exodus of illegal immigrant workers after a Homeland Security probe of the company? When we asked a rep for the popular grocery service about the issues, we were cryptically told to “plan ahead and to double-check available times.” Now, though, FreshDirect brass are finally addressing the problem. Regular users with e-mail logins were sent a letter late yesterday telling them that this month, the company is “going to have a harder time meeting your food needs” than usual. The letter explains the labor issues and employee shortages they’ve been battling. Which is all well and good, but if it means we are going to have to carry an entire spiral ham on the M14 bus back from Whole Foods tomorrow, we might just have to move back to the suburbs. I am writing to you today to update you on FreshDirect, and to reaffirm our commitment to serve you well. January is our busiest month of the year, when school vacations come to an end and our area’s coldest weather begins. It has been challenging for us to keep up with January demand in the past and this January we’re going to have a harder time meeting your food needs than we usually do. You may have noticed that our delivery slots have been selling out more quickly lately and that is a trend which will continue into the New Year. 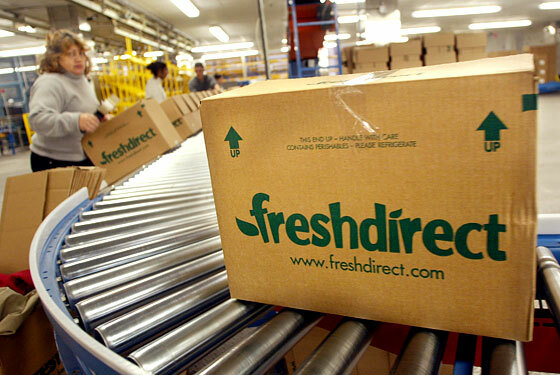 FreshDirect has grown in five years to a company with almost 2,000 employees feeding hundreds of thousands of families. Over that period, we have contributed as many jobs to the New York economy as any company we know. Our employees make fair wages and have comprehensive benefits. As an example, health coverage is available for FreshDirect employees for as little as $5/week — an expensive benefit for us to offer. Each summer, we also have an innovative paid extended leave program that’s available exclusively to our hourly employees. Because of our growth, many of our supervisors have worked their way up through our company from entry-level positions. We recently received a grant from the City of New York to further train our workers, giving them skills that are theirs to keep for a lifetime. We do periodic surveys to insure we are paying fairly, because it is these employees who have made possible the 5 million plus orders we have delivered to you in our history. And we are one of the biggest feeders of NY’s needy, having donated over 1 million pounds of fresh, quality food to City Harvest. You may have read about a recent union vote in our production operations. Suffice it to say, we absolutely support the right of our employees to unionize if they wish — in fact, our 500 transportation workers voted to join a union and currently operate under a collective bargaining agreement. In a secret ballot last weekend, supervised by the NLRB and with two union choices, our plant operations employees voted overwhelmingly (80%) not to join a union at this time. We recently received notice of a federal audit of our records (from the agency formerly known as the INS). As a result, some of our most experienced employees disclosed that their work papers were not in fact adequate and they chose to leave our employment. That some employees were able to gain employment by using false paperwork puts FreshDirect in the same situation as any company in New York hiring entry-level workers and not discriminating on the basis of national origin. But this has hurt our ability to serve you in the short term. We are promoting from within, training and doing external hiring. We will be back at full capacity by the end of January. Our primary objective as a business is to serve you effectively and well. But, in so doing, we take our responsibilities to our employees and our community very seriously. Thank you for reading this and giving us your business. Our whole company is committed to earning it every day.